The activity guides for each unit contain several activities organized around the theme of the unit. The guides provide detailed instruction and additional materials like figures, worksheets, handouts, or readings for incorporating activities into a classroom setting. Each activity also corresponds with a different academic level (Elementary / Intermediate / Advanced), which is noted next to the title of the activity. Art for Embassies (Intermediate / Advanced) – In this activity, students suggest themes appropriate for a large, highly visible art project for a US embassy, and then select a Renaissance (and optionally a contemporary) artist whose oeuvre is appropriate for the work. Taking the role of the artist(s), they submit drawings that illustrate the planned design and explain its rationale. Be a Portrait Patron (Advanced) – Portraiture is perhaps the most familiar type of art today that is bespoke, or custom-made for a patron. 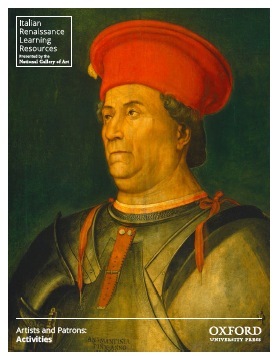 After researching the means by which artists connect with portrait seekers (including through websites), students will select an artist to do their portrait. What a Scene! (Intermediate / Advanced) – In this activity, students become dramaturges to flesh out the relations between artist and patron.